Living rooms are spaces that allow you to play and express your personal style. 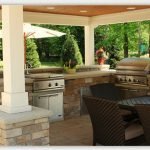 There isn’t a single correct answer when it comes to arranging living room furniture, and it all depends on where the windows and entrance to the room are located, as well as the dimensions of the couch and number of people you want to accommodate. Here are six ideas on how to organize your living room. All feature the same shape of a room, but with the entrance in different locations. 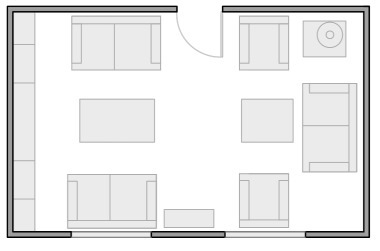 Potential living room furniture arrangement with the entrance at the center. When the entrance is located at the center of the room, consider arranging the furniture parallel to the side walls and focusing the attention on the central part of the space. Place two sofas parallel to the side walls, facing one another, with a large table between them. The wall opposite the window can be enriched with a library that runs the length of the room. A wall of books will add a pop of color to your wall, and avid readers will especially appreciate the practical function that this decorative element serves. A fireplace, unique piece of furniture or sculpture placed against the wall opposite the entrance will immediately capture the eyes of those who enter your living room and help emphasize the central design of the space. 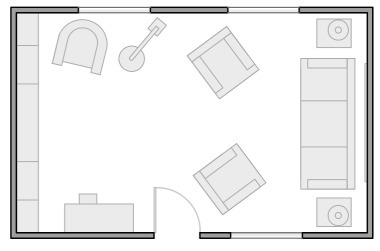 Potential living room furniture arrangement with the entrance at the side and furniture in a “U” shape. If you have a regular floorplan and the entrance to the living area at one side, arranging your furniture in the shape of a “U” can be convenient and eye-catching. Use the side wall that is closer to the entrance as a library, as explained in the first solution. 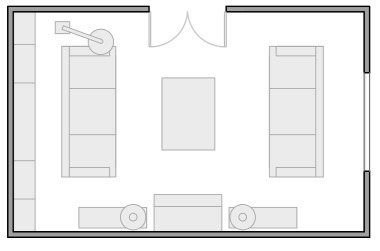 Place two large sofas against two free walls, in a perpendicular arrangement. Use the space between the two sofas for a small table with a lamp. This way, you and your guests can have a place to set drinks near the sofas, and a cozy, lighted space for reading. Be sure to select a table with the right dimensions, so that it fits between the two sofas and doesn’t make the space look cramped. Finally, to close the “U” scheme, place two armchairs side by side, opposite the sofa on the right wall. This will increase the number of seats in your living room, and create a cozy feeling without making the room difficult to walk around in. Consider placing a lamp near one of the armchairs, and a coffee table in the space between the armchairs and sofas. This will make the room look complete, and create the perfect space for conversations. 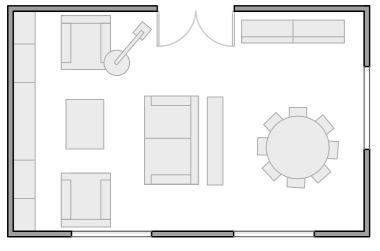 A potential living room furniture arrangement for a space with the entrance at the center of the room. If the size of your living area allows it, consider organizing your space into two parts, separated by a central passage. In this arrangement, the entry area serves as a room divider. You may want to use the same arrangement for both sides of the living room, but be careful — you don’t want the space to seem redundant or have an odd mirror effect. Finally, remember not to leave the central area too bare, and put some pieces against the wall opposite the entrance. 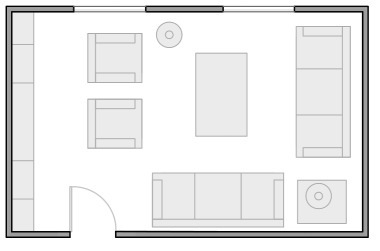 Potential furniture arrangement for a living room with furniture near the corners. A living area can serve many purposes. If you want a multi-functional space, furnish it as follows: On one side of the room, place a library along the entire wall with a large armchair, a pouf ottoman, and a tall lamp. This way, you will have a perfect reading corner, which you can enrich with a coffee table, a carpet or any other useful accessories. In the rest of the room, go for an open scheme, with a comfortable sofa against the wall opposite the library and two armchairs that you can move as needed. Complement the sofa with two small tables and lamps. Complete this area with a favorite work of art or beautiful wallpaper. If you use your living room as a work space, place a small table or desk next to the entrance. In this position, it will not be immediately visible as you enter the room, and your work won’t be the focal point of your living space. TIP: Use our Real-Time Remodeling Calculator and Find Out in Minutes How Much Your Living Room Remodel Will Cost. 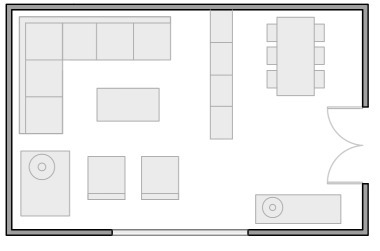 Potential furniture arrangement for a living/dining space. If your living room also serves as your dining area, you have the special task of creating two ambiances in one space. Use the wall without openings to create a library. Arrange a sofa and two armchairs in “U” shape so that they clearly define the area of the room. Behind the sofa, place a cabinet that acts as a divider of the two areas. Place a table in the center of the space that will be used as a dining room. Complete the dining area with some cabinets or cupboards, which will add to the space and provide useful storage for table accessories. Living room/dining room furniture arrangement. Another idea for a living area that includes both a lounge and dining space features a large corner sofa and a coffee table. Add two more chairs to better define the area, and complete the space with a small table and lamp. Separate the living room from the dining area with a library that reaches about the middle of the wall in height. If you need to let light pass through, consider shelves open on both sides. To create more intimate and defined spaces, use a closed shelving unit to create a library. Choose a rectangular dining table, and if space is limited, opt for a table made of glass or other transparent material so it doesn’t dominate the area or make it feel cramped. Good post. When you have kids, it is important to consider how easy it is to clean your sofa. Doing so may help to extend the life of the furniture. Thanks again.